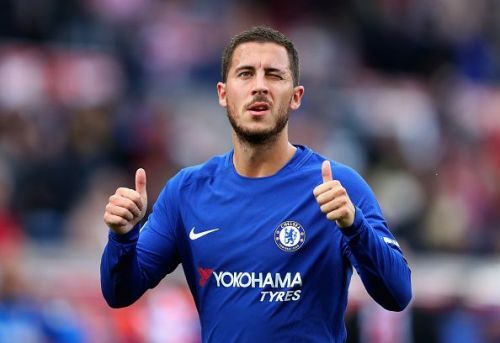 Chelsea superstar Eden Hazard made a stunning revelation about the interest from Real Madrid, in an interview with French Radio outlet RMC yesterday. The player who has been in fine form for Chelsea so far revealed that he has always loved the Spanish giants. He also added that with only 18 months left on his contract, he'll have to make a decision about his future at Stamford Bridge soon. The former Lille forward, who captained Belgium to a third-place finish at the World Cup in Russia this summer, was heavily linked with a move to Santiago Bernabeu after Los Blancos icon Cristiano Ronaldo left for Juventus. But Chelsea managed to hold on to their talisman. Hazard had said earlier this year that he won't be returning to Ligue 1 as a player and would not join PSG after his spell at Stamford Bridge. However, he did drop hints about a possible move to Spain, when he expressed his desire to play in LaLiga one day, according to the Dailymail. The Blues have been successful in tying down two key players in N'Golo Kante and Cesar Azpilicueta at the club to long-term deals, but contract talks with the Belgian have stalled. Hazard was surpassed by Kante as the club's highest earner when he signed a new 5-year deal with them last month. "As I said, I’m already finishing this year with Chelsea, I still have a year of contract after this year, we’ll see." "You know me, I’ve always loved Real, even before [Zinedine] Zidane, we’ll see what happens." "There was a bit of talk [with Chelsea] but then it stopped, now we’re waiting." "The family is in London, I’m also going to be 28. I do not want to have any regrets at the end of my career. It’s a decision I’m going to make, I do not know when, but I’ll take it." "The new coach(Sarri) thinks football like me, so we'll see." Maurizio Sarri has said that the club are willing to offer a new contract to Hazard as soon as the player's representatives show a desire to do business, but the fleet-footed winger looks set to leave London next summer. Chelsea, meanwhile, go up against Hungarian club Vidi in their UEFA Europa League fixture, three days from now.